Constitutional referenda in relation to Third Amendment of the Constitution Bill, 1968, and Fourth Amendment of the Constitution Bill, 1968. Amendment of Fourth Schedule to Electoral Act, 1963. “(5) (a) Where a ballot paper is to be marked pursuant to paragraph (3) of this Rule, the presiding officer may assist the voter by reading out in full from the ballot paper the proposal stated therein and asking the voter ‘Do you approve of or do you object to that Bill becoming law?’ and shall then, unless it is a case to which subparagraph (b) of this paragraph applies, mark the ballot paper in accordance with the answer of the voter, but he shall not act on any written instruction. THE THIRD AMENDMENT OF THE CONSTITUTION BILL, 1968, proposes that in forming Dáil constituencies, the population per deputy in any case may not be greater or less than the national average by more than one-sixth and that regard must be had to the extent and accessibility of constituencies, the need for having convenient areas of representation and the desirability of avoiding the overlapping of county boundaries. THE FOURTH AMENDMENT OF THE CONSTITUTION BILL, 1968, proposes—(1) To substitute for the present system of voting at Dáil elections the “straight vote” system in singlemember constituencies; (2) To establish a Commission to determine constituencies, subject to the right of the Dáil to amend the constituencies as so determined; and (3) To provide that whenever the Dáil is dissolved the outgoing Ceann Comhairle may be returned, without a contest, as a second deputy for a constituency chosen by him which consists of, or includes a part of, the constituency he represented before the dissolution. 2. If you APPROVE of the proposals in the Bill to which the ballot paper relates, mark X opposite the word YES on the paper. 3. If you DO NOT APPROVE of the proposals in the Bill to which the ballot paper relates, mark X opposite the word NO on the paper. 4. Copies of the Bills can be inspected and purchased for sixpence each at any Post Office. 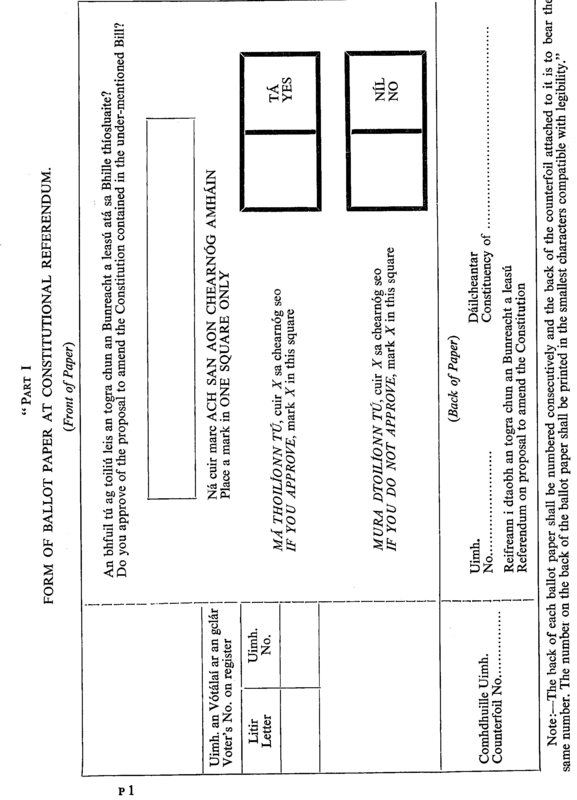 FORM OF BALLOT PAPER AT CONSTITUTIONAL REFERENDUM. 3. —(1) This Act may be cited as the Referendum (Amendment) Act, 1968. (2) The Referendum Acts, 1942 to 1963, and this Act may be cited together as the Referendum Acts, 1942 to 1968. (3) This Act shall be construed as one with the Referendum Acts, 1942 to 1963.